Mixed mode: Completion of pre-course study plus 3 hours of practical training on-site. 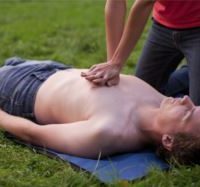 An automated external defibrillator (AED) is a portable electronic device that automatically diagnoses the life-threatening cardiac arrhythmias of ventricular fibrillation and pulseless ventricular tachycardia, and is able to treat them through defibrillation, the application of electricity which stops the arrhythmia. Responded to at least one simulated resuscitation scenario contextualised to the candidate’s workplace/community setting. Recertification recommended every 12 months. Complete the online or paper-based pre-course workbook and attend a 2 hour practical course.